The continued development of cabinet hardware with enhanced security has always been important and accounted for much of the evolution in such products – over time we have seen a refinement of this process with major manufacturers bringing through countless small improvements in mainstream ranges as well as innovative solutions in new areas. Perhaps because this has been a continuous process over many years the area of cabinet locking technology is one that is often perceived as moving slowly. However As part of this process a number of sophisticated design initiatives have been developed into products which meet these needs. Included in this have been products such as the 1155 combination swinghandle and the 1154 vandal resistant swinghandle, in both the standard zinc die-cast and now in stainless steel. Not only have the materials been increased in specification, but many crucial features have been incorporated at the same time – such as recessing the handle into the door – making it suitable for both vandal and harsh environments. The ultimate in security consciousness for many situations would be to incorporate the BioLock fingerprint technology which is especially suited to server cabinets and the protection of valuable/sensitive data – or its sister program of highly flexible Electronic Locking Modules – ELM and Agent E – into an industrial cabinet . This program incorporates the ability to upgrade from standard key locking swinghandles by simply changing the lock module for the electronic module. 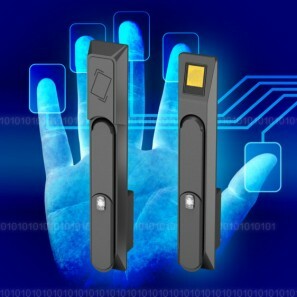 The ELM offers the benefits of a transponder key ( with up to 4 billion possible combinations ) or remote locking as either a stand alone option or a fully Networked version, with the ability to generate a complete access log. Remote locking in this case would include digital pad, system management enabled computer possibly addressing or finger print/retinal scanner. When combined with concealed hinges the resulting installation need not have an external handle or other obvious point of entry. Typically an engineer could visit a remote site, then use mobile phone communication to open the cabinet directly, or to call for it to be opened by the site control centre and simply close the door when finished. At the stand alone end of these installations, application specific requirements have already lead to the ongoing development of custom handles that incorporate the ELM operating keypad within their handle design. A typical requirement along similar, but lower tech’ lines has come from a major public utility, where standard insert developments have lead to customer specified designs. 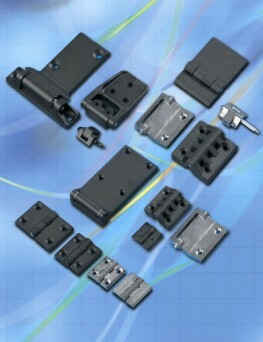 In this case the addition of a specific square insert was required with security pin to prevent standard tool operation. The insert also has a special salt resistant coating to suit the environment conditions as specified by the customer. Developments in the EMKA hinge program with a view to enhanced security include the likes of additional materials, such as with the 1056 ranges which now have more polyamide versions and stainless steel, again to enable customer problems like harsh environment to be resolved. Blind fixing of hinges has been further enabled as we have increased the number of hinges that can be fitted with a single pin. This has the double benefit of greatly reducing the fitting times during assembly while also enhancing security with a “through-panel” tamper resistant blind fixing. As previously mentioned material additions to certain ranges have given customers more options to solve more problems. 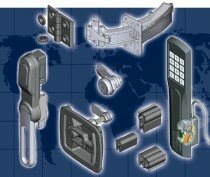 Extended ranges of polyamide products offer alternatives to die-cast in many applications for reasons of superior performance and lower cost, often with longer life and corrosion resistance, while for more extreme duty we have seen additional stainless steel production coming through in both hinges and locks. Over the years significant progress has been made in enclosure and cabinet Sealing, where developments include a number of Low Smoke and Low Toxic versions of standard gasket sections, produced to suit problem areas such as those where installation specifications include underground sites, or anywhere there is a potential smoke hazard within a confined space. In terms of the security of technology regarding Electro-Magnetic Compatability – we have seen an increased number of applications with requirements for both EMC and IP protection combined in one gasket. 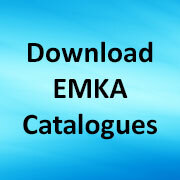 This need has been met by EMKA engineers who succeeded in producing a number of sections with high attenuation against magnetic, plain wave and electrical interference, such that now a complete system is available for the specialist cabinet builder to incorporate into custom designs. Share the post "Locking Technology notes"